There's been a lot of talk about Coup, a Kickstarter by the same company that released IpBoG staple The Resistance. It's been out of print of a while but I noticed it was back in stock last week and immediately put in an order for it. It came on Monday morning so I brought it to Cult that evening. I arrived early and immediately launched into a game with Matt and Muir. It's a short game that you can get through in about ten minutes. I like to think I won but I really can't remember. Johnny arrived and we played a second game. I like to think I won the second game too but I probably didn't. We hit 15 people this week with 4 newcomers. I'm still dreaming of the day we hit the dizzying heights of 21 like the first ever meetup. We split into two groups with the larger of the two playing Skull and Roses. 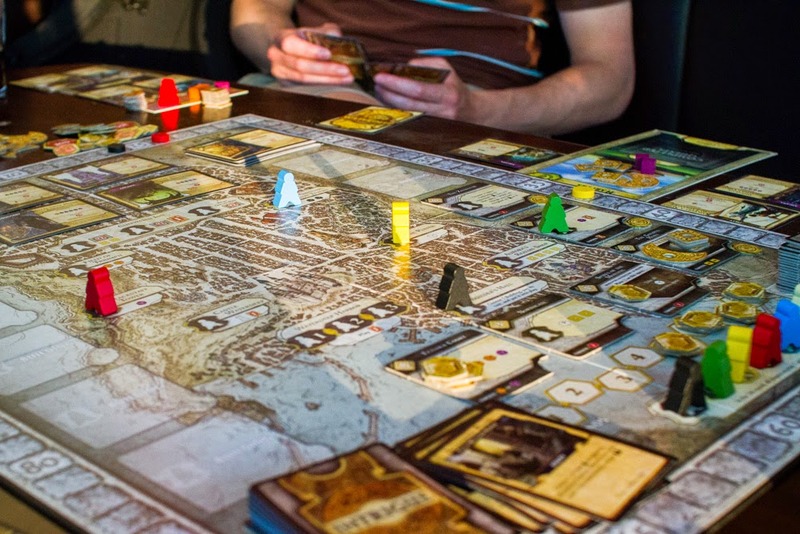 I opted for Lords of Waterdeep. Although Waterdeep gets played a lot it was my first time playing it. I'm not always a huge worker placement fan (I find the abundance of choices overwhelming) but this game I enjoyed. Adam's Lord gained extra victory points for building and he played this strategy hard. I don't think he completed one quest in the whole game. All building spaces were filled and I think only a couple were occupied by other players. He was trailing behind on the points track, hoping to make up for it with bonus points at the end of the game. After a slow start I sped into the lead. Nothing could stop me, or so I thought. Muir sped up behind me, closing the gap. For a while there was a cold war going on, I had a mandatory quest I wanted to play on him but I knew he had one too and as soon as I played mine he'd play his back. On the last round he played his on me, also revealing that he had an influence card that would remove a mandatory quest if played on him, rendering mine pretty much useless. I completed the mandatory quest but Muir had crept into the lead. I completed one final quest but could't quite catch up. It was all down to the bonus scoring. Adam's strategy ultimately didn't pay off, although he wasn't last he was far from me and Muir. I scored well, putting me over 20 points ahead but Muir fared well too, placing him just in front and securing him first place. After Skull and Roses the table next to us had been having the loudest couple of games of The Resistance I think we've ever had. People were really getting into the bluffing and discussions. The maximum 10 players were involved and the game really seemed to shine. There was one win for the resistance and one for the spies. A few people left and we split into 3 different groups. The Works have had some budget Rio Grande titles in recently and I picked up Havana for £10 . It's a role selection game, a kind of cross between San Juan and Citadels, and well worth every penny. This was a tense game, it took me a long time to get off the ground and score a single point. It looked like Dan was a sure winner but everyone teamed together, using their actions so block his attempts. I was paying so much attention to his game that I missed a combination that would have won me the game. Instead Rob made the play, constructing three buildings in a single turn. However, in the end our valiant efforts were in vain and we couldn't stop Dan from claiming victory. Next to us Matt and co. had been playing Pandemic and saved the world on the normal difficulty. Although Pandemic isn't as tough as the notoriously hard Ghost Stories, still not a simple feat. 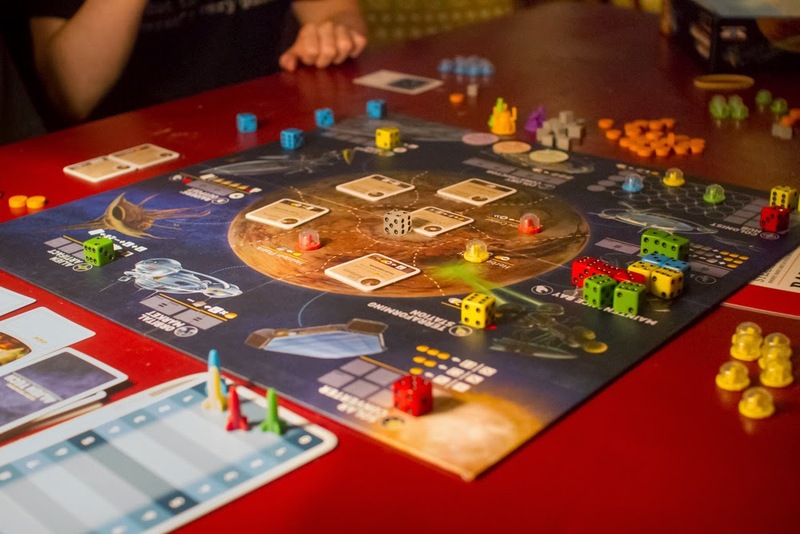 The third table had been playing Alien Frontiers, one of the early Kickstarter board game success stories. 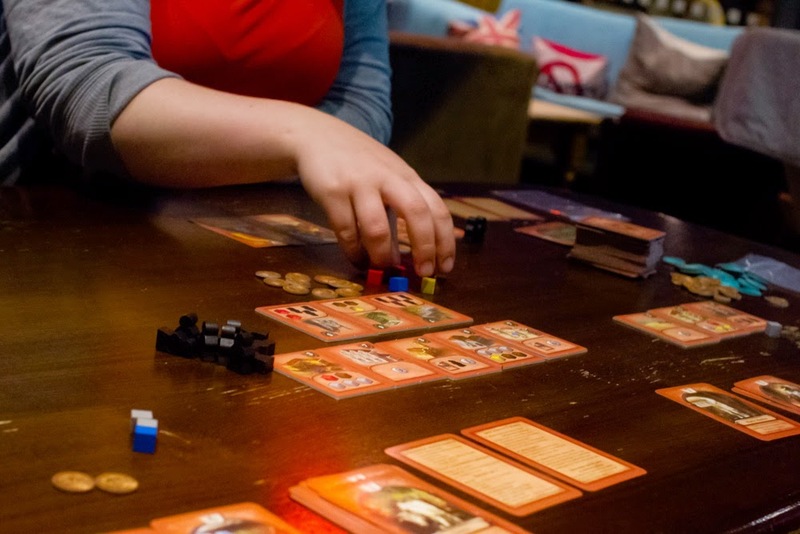 Although not the version from the original Kickstarter, it was the second pressing with the Kickstarter-style miniatures instead of tokens. Adam won. There was just enough time to get a couple more games of Coup in. I might have won them both, I really don't remember. But I do remember that I won the final game. It came down to just me and Dan, both with a single card left. I had been bluffing for the last few turns and it was going in my favor. If I kept up with the bluff I would be able to call a coup and take Dan out. Dan was about to call me on it but a turn too late, I stopped bluffing, grabbed a final extra coin and coup'ed him out of the game.